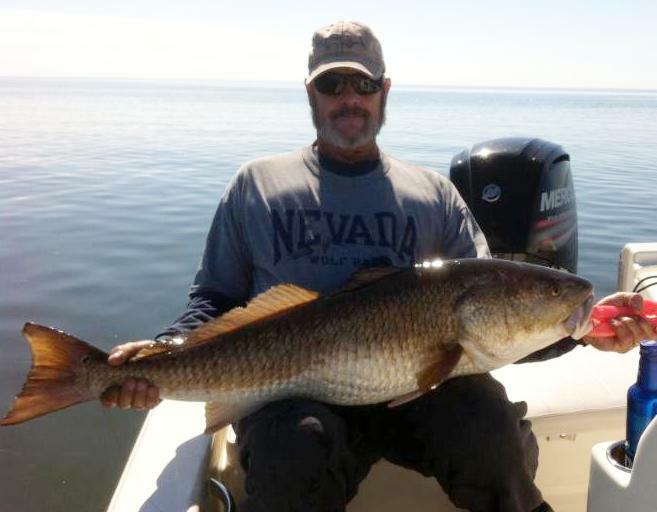 One of the characteristics of winter fishing in the Big Bend is inconsistency. With fluctuating temperatures, very low daytime tides, and blustery weather, a good fishing day requires some planning, and I’ll make some suggestions in my forecast for this month. In spite of the challenges, committed anglers were able to get some great catches this month, as you can see in these pictures from January. Sea Hag’s own Kristin Skipper with a giant overslot redfish. Before gag grouper season ended at the beginning of the month, Judge Dave Reiman brought in this fine specimen. 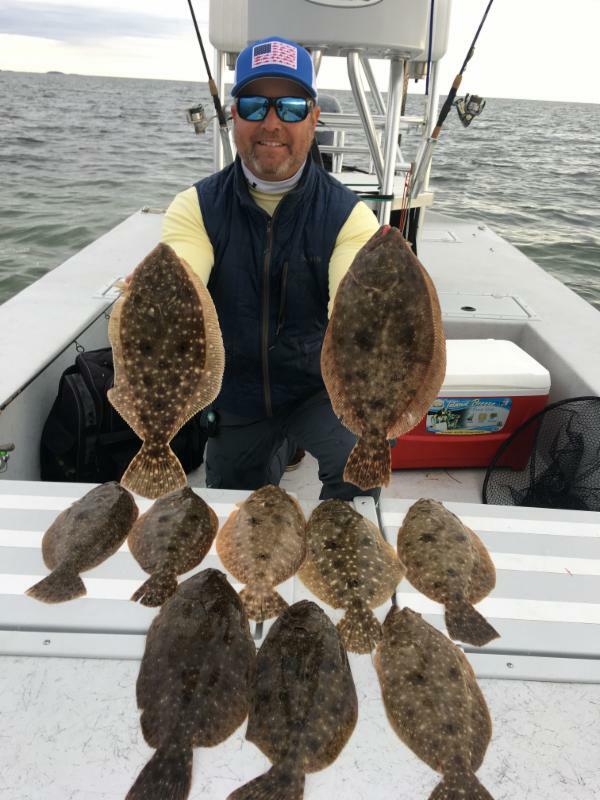 If there’s a time of year to target flounder, this is it. 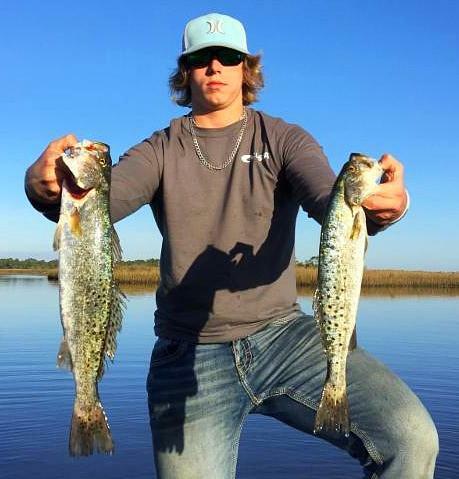 Adrian Rust from Jacksonville slow-crawled jigs over sandy bottom to find these tasty guys. 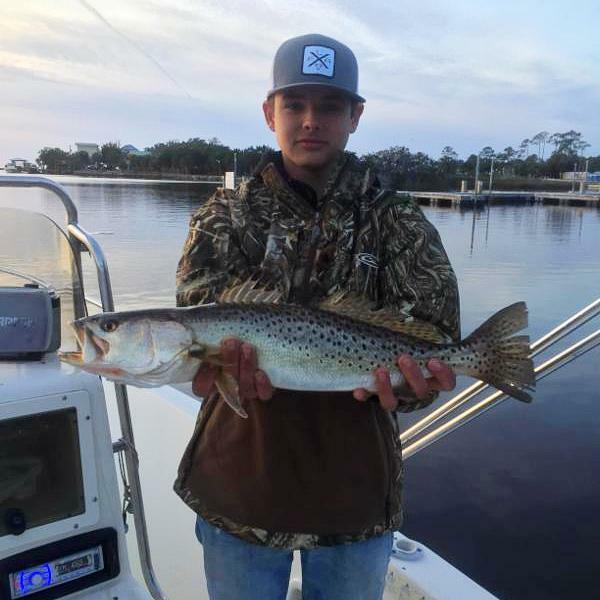 Austin Edwards caught this fine trout in the channel right in front of the Sea Hag Marina. 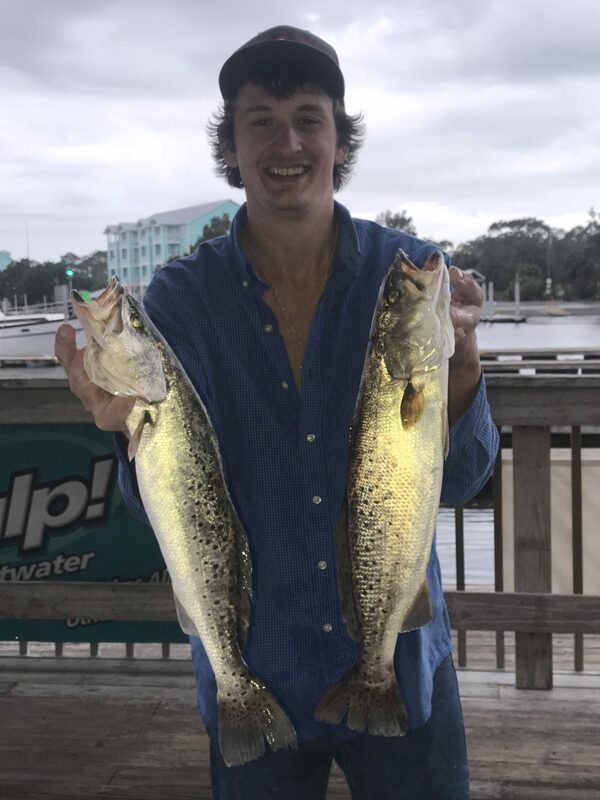 Dusty Chavous from Dixie County with a pair of fine trout caught just outside a creek mouth. Paul Austin from Townsend, Ga. with a smoker kingfish. Here’s a rare one: Eric Griffis found this snook way up the Steinhatchee River. 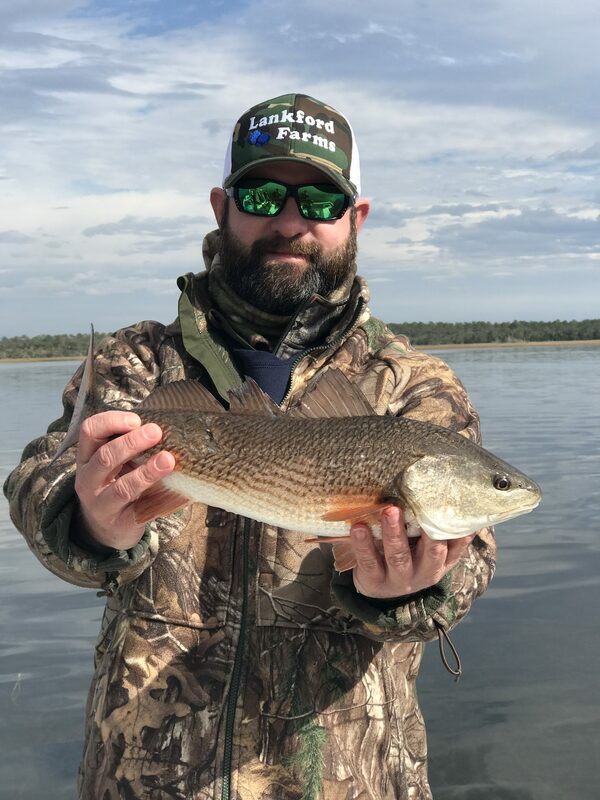 Woody and Dunbar Graham from Gainesville braved the cold and found this redfish. Jason Gamage from Tifton, Ga. with a keeper trout. Chris Grellman with a 44 inch redfish! 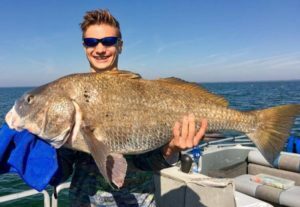 Matthew White from Keystone found this giant black drum fishing around oyster bars. 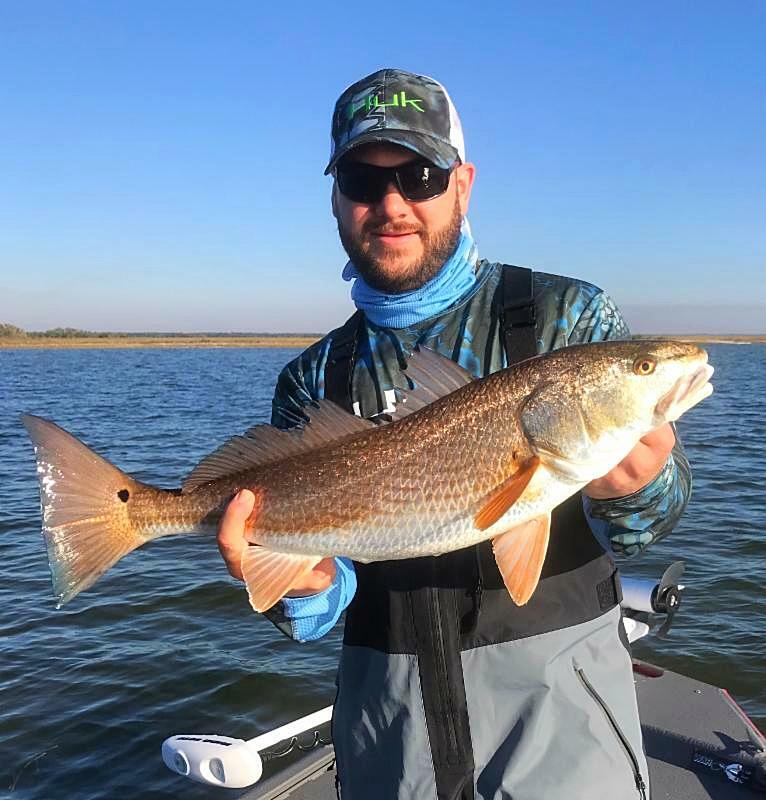 Matt Brown took advantage of a beautiful afternoon to find this slot-sized redfish. Chris Harp from Crestview found a school of beautiful winter-time trout. 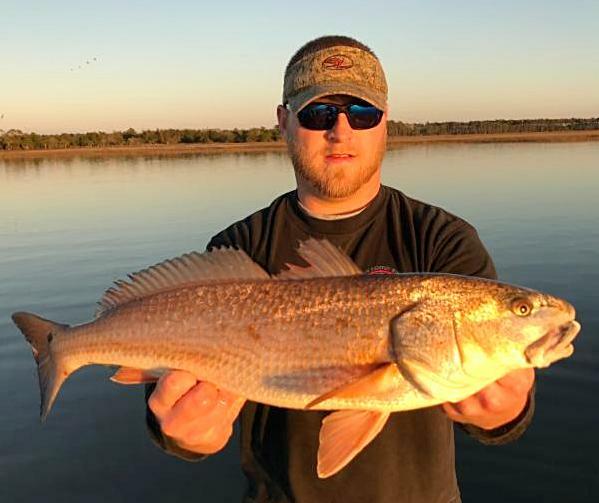 Brad Conlon from Eastman, Ga. caught a perfect 27 inch redfish on a Gulp bait. 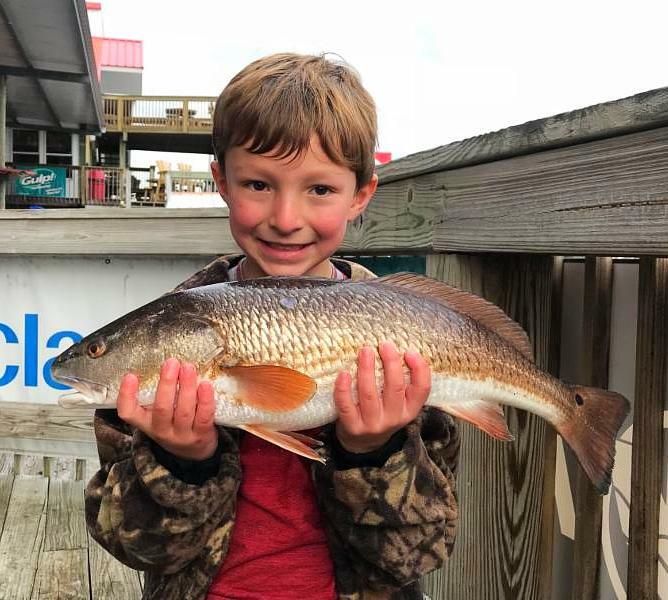 Sawyer Huling from Clyattville, Ga. fished with a live shrimp and caught this redfish all by himself. 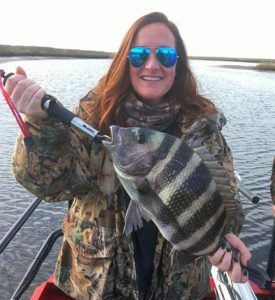 A sign of things to come: Caroline Wilson from Valdosta caught this sheepshead in a creek. February is pretty much like January, although by the end of the month there is usually a consistent warming trend. The goal for recreational anglers is to try and increase your chances of success for each trip. While our guides generally don’t have this flexibility, if you do, it’s worthwhile planning your trip. Your first decision is whether you are willing to fish the river. When water temperatures get into the mid-50s and below, there are trout and some redfish, along with black drum and croaker, in holes in the river. They are rarely stable in location; they move with the tides and changes in temperature, and can be found all the way upriver to the Landings. 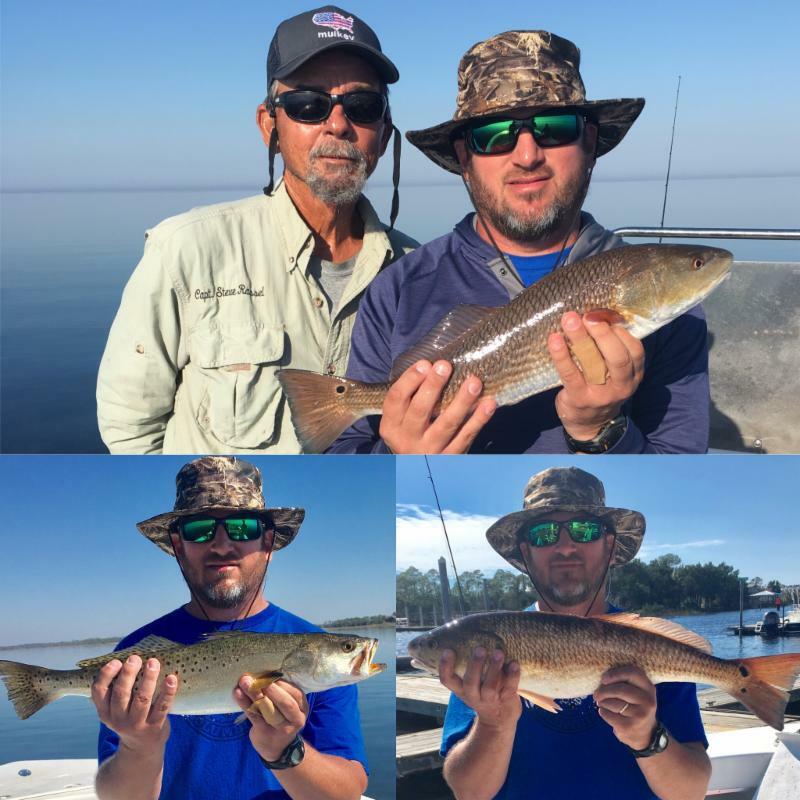 Fishing deep in rocky holes with Gulp baits or live shrimp can be productive. But if you want to catch generally larger fish, you need to get outside of the river, even if it’s a challenge. How can you make it easier? Plan. Look at tide tables and marine forecasts. 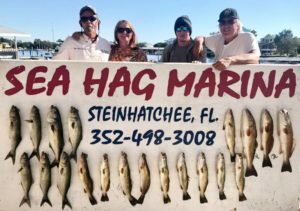 Daytime winter tides can last much of the day, keeping you from nearshore structure that can hold fish. Unless you have access to creeks with an airboat, kayak or jet drive, you’ll be fishing in deeper water and the fish are more scattered. 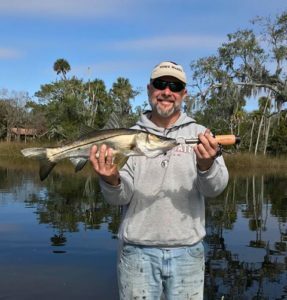 When you can get into creeks (Dallus being the primary example), you’ll usually find a good number of keepers mixed with smaller fish. 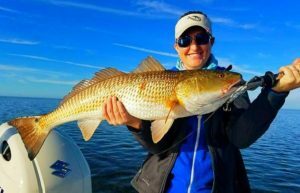 Schools of larger fish are hard to find but can provide an amazing day of fishing when you locate them. 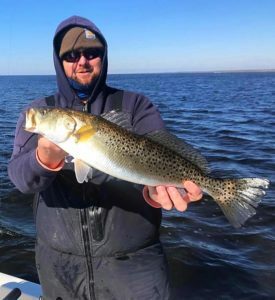 During warmer times of the year, large trout are usually solitary and they relate to areas with baitfish. 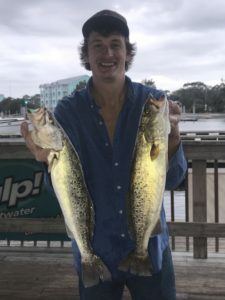 They come close to shore to feed at daybreak, which is the best time to find these fish. In the winter, they relate more to water temperature, which means structure. 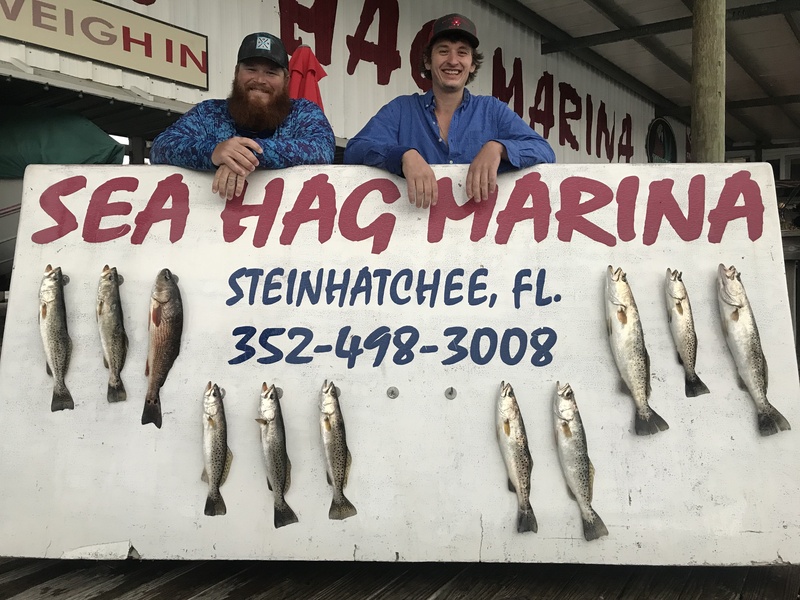 Try to pick days with afternoon high tides that allow you to get to rockpiles and creeks. Small craft advisories are never fun, but they’re so much less comfortable in the winter. Fishing structure in the winter for trout is a great time to try fishing slowly suspending lures. In many years of fishing, I’ve yet to find another lure that works better in the winter than Paul Brown’s Corky Devil lures, which we’ve been using for fifteen years or so, long before they were purchased by Mirro-Lure. 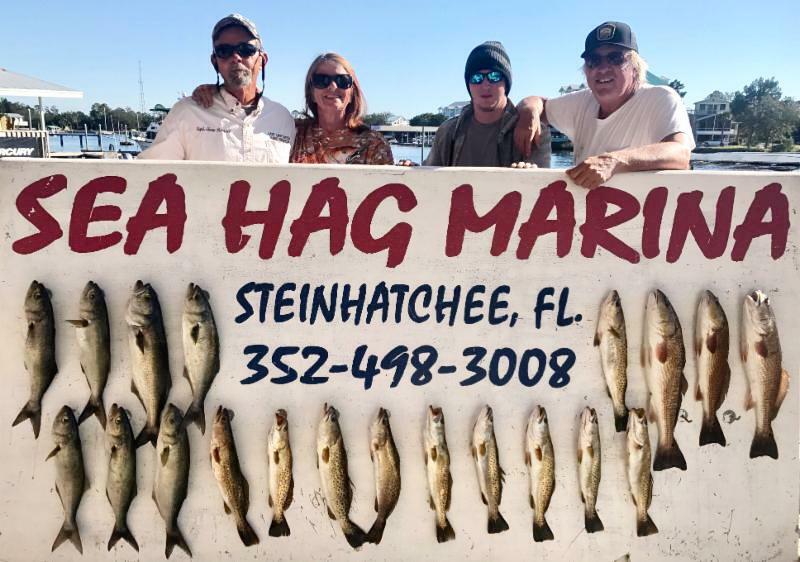 There are other slow-sinking lures that run shallow, including Live Target Sardines and others, all of which you can find at the Ship’s Store. Whatever you fish, fish slow. 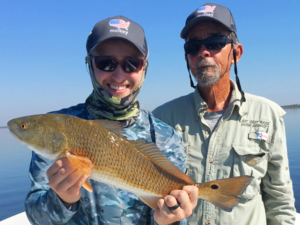 You cannot catch fish in frigid waters by rapidly jigging whatever you’re fishing with. Move from rockpile to rockpile, fishing oyster bars if you can get to them. 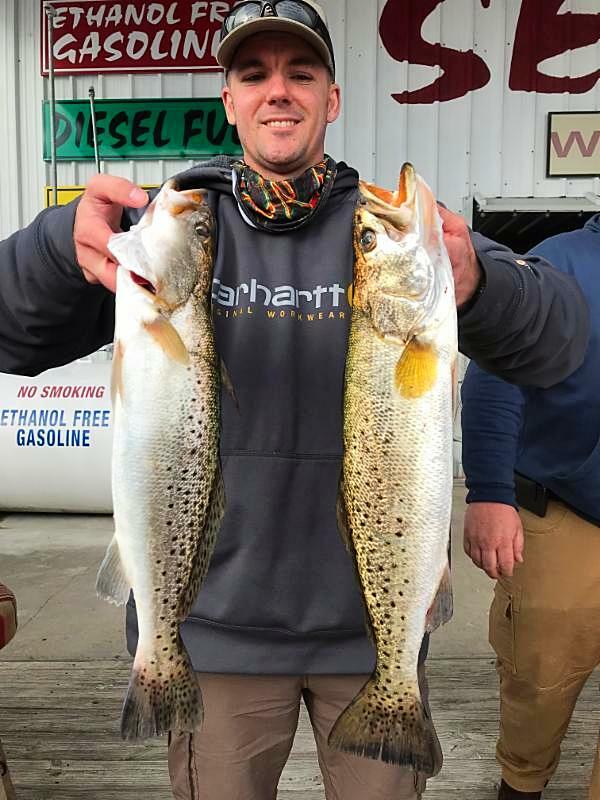 In general, when you find one large trout, there will be many more around so be patient. Pick your days to have the most success during the winter months. There have been several changes in regulations that everyone should be aware of. 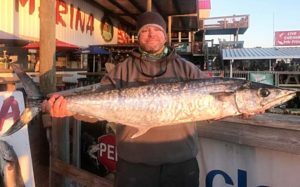 Currently, amberjack are scheduled to be closed as of January 27th, and the season is considered closed until July 1. However, another rule is being developed that will set a spring season, so stay tuned. With regard to cobia, there is no change in size limits or season. 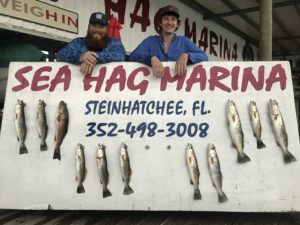 However, the boat limit per vessel has changed from six to two cobia per vessel per day. 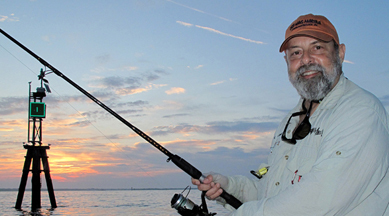 You cannot have more than two cobia on your boat at any time. 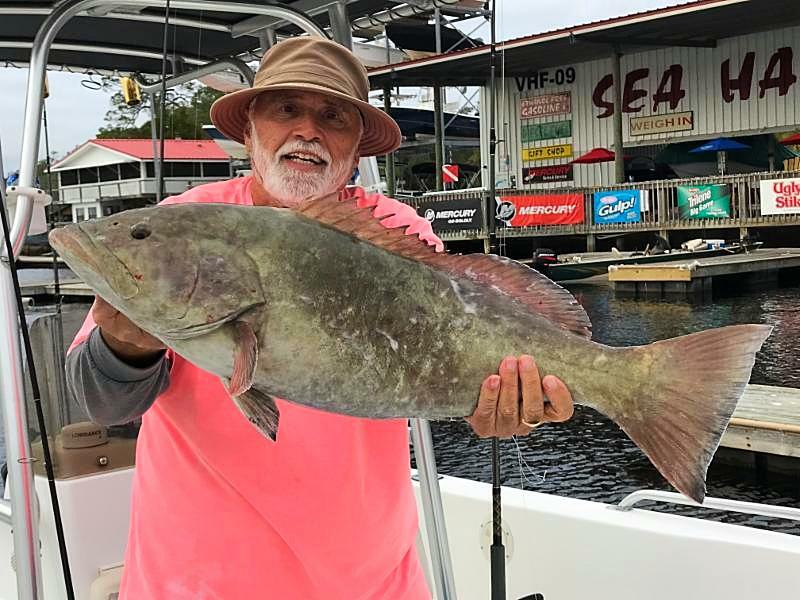 Gag grouper remain closed until June 1. The big local event in February is the Fiddler Crab Festival, this year the weekend of February 16-18th. There is a tournament on Saturday the 17th so combine your festival trip with an opportunity to win some excellent prize money ($500 for the largest trout and the largest redfish, plus other prizes). 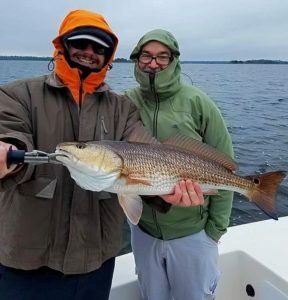 The bite has been as temperamental as the weather but even on slower days the fishing has been good. 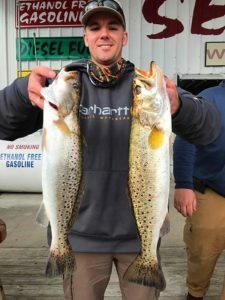 The big trout are starting to school well and when we get on top of them the bite is amazing. I have plenty of days available and would love to show you where I have been finding them. Also don’t forget scallop season will be here before you know it and everything is starting to book up already. Book early to get the best days before it’s too late.